Bearded Dragons are omnivorous lizards found in Australia. Rocky is one of our largest Bearded Dragon and he loves meal worms. “Rocky” came from a breeding facility where unfortunately, his foot was bitten by another Bearded Dragon. Due to his injury “Rocky” came to live with us at Critter Squad and now is a great education animal. Blue Tongued Skinks are omnivorous lizards that use their blue tongues to ward off potential predators. “Blueberry” was donated to us from a private party where he was a personal pet. “Blueberry” now lives here at Critter Squad where he enjoys a diet of vegetables and worms. “Muffin” was originally in a pet store where he lived with many other Blue Tongued Skinks. “Muffin” had part of his tail bitten off and came to Critter Squad to be part of our education program. American Bullfrogs are large, carnivorous frogs native to most of North America. The males produce a loud, deep call, which sometimes can sound like a cow mooing. ” Bert” and “Ernie” are an invasive species to California and were being sold as pets by a breeder. Currently “Bert” and “Ernie” are great educational animals and go out for education programs on a regular basis. African Bullfrogs are large, carnivorous frogs that can reach up to 10 inches in length. They are born as tadpoles, undergo metamorphosis, and in a few years become full-grown Bullfrogs. “Kermit” and “Ms. Piggy” were both donated to education department where over the years have taught children everything there is to know about African Bullfrogs. Sulcata Tortoises, sometimes referred to as African Spurred Tortoises is the third largest tortoise species in the world. They are native to the Sahara desert and are commonly kept as pets until owners realize how big they get. “Bolder” was donated to us from a private party, he now lives at Critter Squad where enjoys long walks around the yard. “Goliath” was being housed as a rainforest animal and due to improper husbandry his shell rotted and ended up needed veterinary care. Once “Goliath” recovered he was confiscated by Animal Control and brought to us to use for education. Ball pythons are the smallest species of python, found in Africa. They are non-venomous and receive their name because they tend to curl into a ball when they are stressed or frightened. These snakes are common as pets due to their docile temperament. “Houdini” is Critter Squad’s very first snake and has educated the lives of hundreds of children over the last 11 years. Honduran Milk Snakes are non-venomous snakes that are red with bands of black and yellow along their bodies. They can reach lengths of up to 5 feet and live 12-15 years. Ruby is one of our friendliest snakes and she loves to be handled and taken out for shows. “Ruby” is one of our most famous animals at Critter Squad. “Ruby” came to Critter Squad from a local reptile society and has been living with us for the last two years. Green Iguanas are large, herbivorous lizards native to South and Central America. These iguanas are arboreal and great climbers. They can fall up to 50 feet from a tree and land unharmed. “Iggy” was a pet who was kept chained up on the side of the house where all she was fed was grapes her entire life. She now lives with us at Critter Squad and enjoys lounging on branches under her heat lamp. “Green Bean” was a pet who was kept in closet and was never able to sun bathe. “Green Bean” became very ill and was brought here at Critter Squad where we brought him back to health. Red Tailed Boas are large, heavy bodied snakes found in South America. Boas are ovoviviparous snakes, which mean the embryos develop inside eggs that are retained in the mother’s body. When the eggs are ready to hatch, it as if the snake is giving “live birth”. “Gypsy” was confiscated from homeless person on Sunset Blvd who kept her in a pillowcase and would bring her out to take pictures. “Gypsy” is now one of our amazing education animals. The Burmese Python is the largest subspecies of Indian Python that can reach up to 19 feet long. They are mainly nocturnal and can be found living in rainforests. Asian Water Monitors are the third longest lizards in the world reaching up to 9 feet in length. They are found throughout Asia and India and they are excellent swimmers. Asia is very mischievous and curious, always trying to climb out of her enclosure and she has become a very talented jumper. 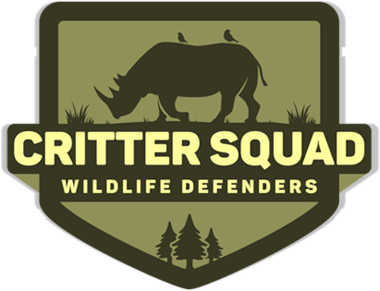 “Asia” was donated to Critter Squad by another educational outreach company. “Asia” enjoys exploring the facility and finding new places to hang out in. African Pygmy Hedgehogs are small, oval bodied mammals found throughout Africa. Their bodies are covered in spines which are actually modified hairs. “Sonic” was donated to us from a private party. “Sonic” favorite treats are super worms and can eat them all day long. Degus are small diurnal rodents found only in Chile. They are highly social and intelligent and work together to dig elaborate burrows. “Fred” and “Wilma” were given to Critter Squad by people who could not care for them any longer. “Fred” and “Wilma” live together and throughout the day vocalize to their babies “Bam Bam” and “Pebbles”. “Bam Bam” and “Pebbles” were born in April and “Fred” and “Wilma” are their parents. “Bam Bam” and “Pebbles” enjoy running around their enclosure and making intricate tunnels. Flemish Giant Rabbits are on of the largest of the domestic rabbit breeds. They generally weigh about 22 pounds and are about the size of a dog. “Hindu” was born in January 2012 and at just 9 months old already weighs 15 pounds. “Hindu” enjoys going out for walks, eating grass and relaxing. Chinchillas are rodents adapted to live in high altitudes and are native to the Andes Mountains. Chinchillas have a very unique coat, there are up to 50 hairs per follicle and velvet-like fur. “Gizmo” was brought to Critter Squad through West Valley Animal Shelter where he was put up for adoption. “Gizmo” loves to take regular dust baths to keep up his nice healthy coat. Silver Appleyard Ducks are a domestic breed of duck. They are large and can weigh 6-8 pounds when full grown. These ducks have a blue-cross stripe on their wings. “Cupid” was donated to us when he was just a little duckling. He currently lives with several other Silver Appleyard Ducks and enjoys the fresh open air. Blue and Gold Macaws are large parrots covered in vivid blue and yellow feathers. They are very intelligent, social birds. Macaws usually bond for life and require a lot of attention. They can live 60-80 years. “Jade” is one of the first birds to come to the Critter Squad, currently she is 3 years old and is a great educational animal.